After a car accident left him with both a disabling injury and a monetary settlement, destiny seemed clear for Montes. He wanted to start a medical marijuana dispensary in his Central California hometown, so that patients like him wouldn't have to drive hundreds of miles just to get their medication. He followed this dream, partnering with former football buddy Luke Scarmazzo and starting the California Healthcare Collective in Modesto. But after a September 2006 law enforcement raid resulted in severe criminal charges, the two men would become the first medical marijuana dispensary operators to go to trial in federal court. After two days of deliberating, however, their jury returned guilty verdicts for cultivation, possession with the intent to distribute, and continuing criminal enterprise. That last charge, which can carry a life sentence, required both defendants to be jailed upon conviction. This remand tore Montes away from his four-year-old daughter on her birthday, leaving his sobbing mother to collapse in the courtroom hallway and his pregnant wife to give birth to their first baby boy without him. 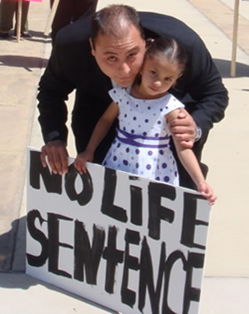 In November 2008, Montes officially received a sentence of twenty years in federal prison. I did run the medical marijuana dispensary. I accept responsibility for breaking the federal law, but I wouldn’t be here without the state law. That’s pretty much it.